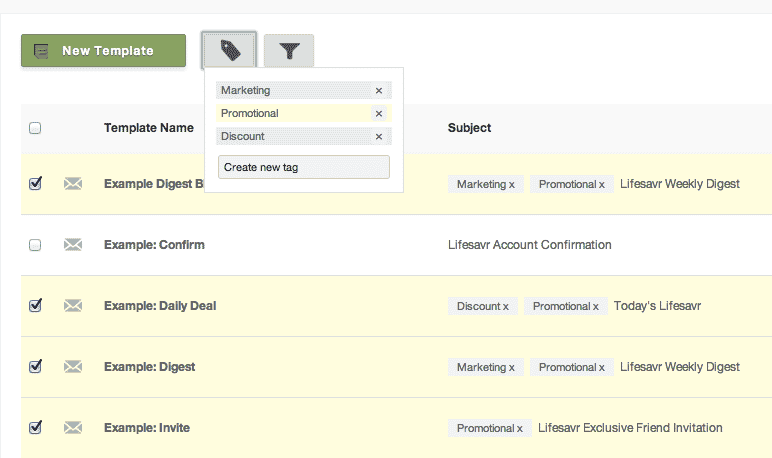 From the main Templates page, add customized labels to your templates for easy organization and filtering. The set of labels you create is also available to apply to campaigns in the Campaigns pages. Likewise, labels that you create for campaigns can be reused to apply to templates. 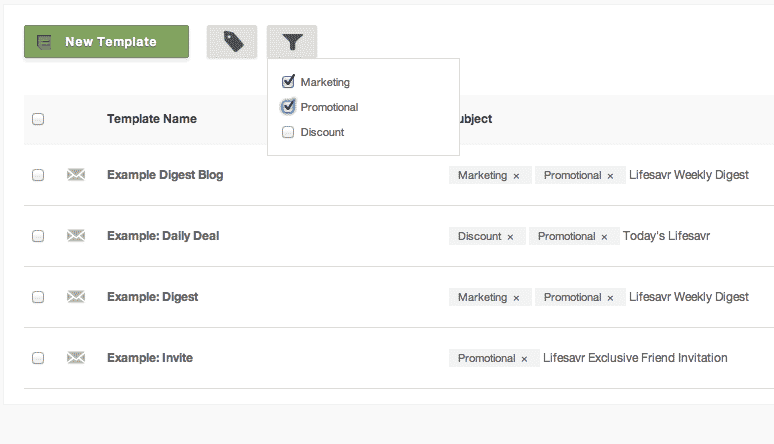 On the Template page, you’ll see three options: New Template, Add Label, and Filter. Click the middle Label button to add a label. Clicking Add Label will open a dialog that lists all your existing labels and has a field for adding new labels. Type the label name field and press Enter to submit. Your Sailthru account can have up to 200 labels. To remove a label, click the X to the right of the label name. To apply the label to your templates, check the box to the left of the template name. Then, click the Add Label icon and select the name of the label you want to apply. You can add multiple labels to a single template or you can add a label to multiple templates at one time. After applying the label, the label will appear next to the subject line under the Subject column. On the Template page, select the Filter button. Selecting the Filter button will open a dialog window that allows you to check off one or multiple labels to filter. The Templates page will filter to show you only the templates that have the selected label applied. Uncheck the box in the Filter dropdown or click the Templates tab to refresh the page and return to a view of all templates.